IOWater statutes were updated on 12 December 2000. Pool their skills and develop partnerships between French and foreign public and private organizations and to carry out projects and programs of common and collective interest in order to better respond to the requests and needs requiring the multiple and more and more complex know-how of the "International Water Community". In France, to reinforce and multiply the actions of the various public and private stakeholders of the sector. Develop expertise and assessment abilities in these areas, especially on legal, economic and institutional issues, to foster local or regional skills and to promote integrated water resources management in the interested countries. Its home office is located in Paris. To be become a member, you must be approved by the Management Board and your contibution duly paid. 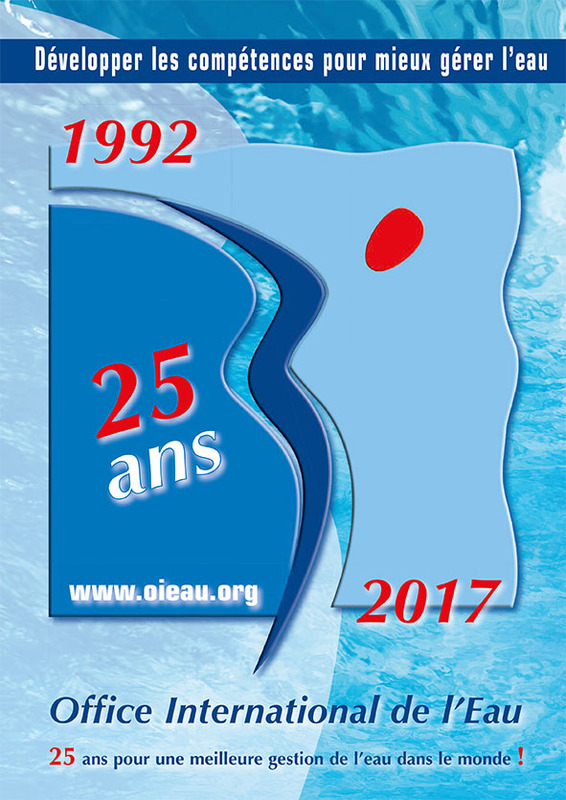 Members of the French Association for Water Studies (AFEE) and the International Training Center for Water Resources Management (CEFIGRE) are members of the Association. The members of the Association may be founder members, associate members, active members or corresponding members. The founder members are those who have contributed to the Association's own funding by providing a minimum amount set by the General Assembly as reserve funds, without recovery right. Associate members are those who participate in a joint activity with the Association by making personnel, data or know-how available or by participating, specifically and significantly, in the pre-financing of the activity development. Membership is reserved for public institutions, small and medium-sized enterprises, associations, foundations and foreign members. The annual dues for each category of members shall be determined by decision of the General Assembly. The title of honorary member may be awarded by the Management Board to persons who render or have rendered services to the Association. This title confers on the persons who obtained it the right to be a member of the General Assembly without having to pay a contribution. The former presidents of the AFEE, CEFIGRE, the Water Institute, and subsequently the "INTERNATIONAL OFFICE FOR WATER" are honorary members of the Association. Disappearance of the legal entity or company concerned. The Association shall be administered by a board of  members. eight members from private sector companies, banking institutions and water users. The members of the Board are appointed for 3 years and renewed in full every 3 years. The Board shall select by secret ballot a Bureau from among its members. It shall be composed of a president, four vice-presidents, a secretary and a deputy secretary, a treasurer and an assistant treasurer, including one member representing respectively the Local Communities of Limousin and Provence-Alps-Riviera. The number of Bureau members cannot exceed one-third of the Management Board. Three representatives of foreign members of the association on the Management Board may also participate in the meetings of the Bureau. The Bureau is elected for 3 years. In the event of a vacancy, the members of the Board shall be replaced by the next General Assembly. The powers of the members so elected shall end at the time when that of the replaced members should normally expire. The members of the Management Board may co-opt, on a temporary basis, the replacement of a member who has resigned between two meetings of the General Assembly. Representatives of the French Ministries responsible for Foreign Affairs, Agriculture, Foreign Trade, Environment, Equipment, Industry and Health and the Financial Controller of the organizations being under the supervision of the Ministry for the Environmen:. representatives of the founder members of the Association, as well as of associate members for matters concerning them, whose designation shall have to be approved by the Management Board. a second representative of the local authorities of the Limousin Region and the Provence-Alps-Riviera Region respectively. The presidents of the International Network of Basin Organizations and the Euro-Mediterranean Information System on know-how in the Water Sector. The presence of at least one third of the Board members is necessary to validate the deliberations. The decisions of the Management Board are made up by a majority of votes. In the event of a tie, the President's vote shall prevail. Each member may delegate his powers to another member and may only hold a power. Minutes shall be kept of the meetings. The minutes shall be signed by the President and the Secretary. They shall be drawn up without blanks or erasures on numbered sheets kept at the Association home office. The members of the Management Board cannot receive any remuneration because of the duties entrusted to them. Only expenses refunds are possible. They must be the subject of an express decision of the Management Board, decided on without the presence of the persons concerned; Justifications must be produced that shall be checked. Agents paid by the Association may be called by the President to attend, in an advisory capacity, the meetings of the General Assembly and Management Board. The General Assembly of the Association shall include all its members as defined in Article 2. It shall meet at least once a year and each time it is convened by the Management Board or on the request of at least one quarter of its members. Its agenda is defined by the Management Board. It chooses its Bureau, which may be that of the Management Board. It approves the accounts for the closed fiscal year, votes the budget for the following fiscal year, deliberates on the items on the agenda and, if necessary, provides for the renewal of members of the Management Board. It hears reports on the Board’s management, on the financial and moral situation of the Center. It decides on the mechanisms of funding and use of the reserve fund made up of the contributions of the founder members. The annual report and accounts are sent to all the members of the association. The decisions of the General Assembly are made up by a majority of votes. In the event of a tie, the President shall have the casting vote. Each member may delegate his powers to another member and may only hold five powers. Except in accordance with the provisions of the preceding article, the agents paid by the Association shall not have access to the General Assembly. In the event of legal representation, the President may only be replaced by a representative acting under a special power of attorney. The representatives of the Association shall have full civil rights. The deliberations of the Management Board concerning the acquisition, exchange and disposal of buildings necessary for the purpose pursued by the Association, the issuance of mortgages on the said buildings, the leases exceeding nine years, the alienation of property included in the endowment and loans must be approved by the General Assembly. The deliberations of the Management Board relating to the acceptance of gifts and bequests are valid only after administrative approval given in accordance with article 910 of the Civil Code, article 7 of the law of 4 February 1901 and Decree No. 66-388 of 13 June 1966, as amended. The deliberations of the General Assembly relating to the disposal of movable and immovable property depending on the endowment, the issuance of mortgages and loans are valid only after administrative approval. The Management Board shall also appoint the directors of specialized bodies or departments, after consulting the Director General. The Documentation and Data Department which manages the logistics of the National Center for Water-related Information and Documentation in Limoges. Each Department manages, under the authority of the Director General, all the resources necessary for carrying out its tasks, under the control, whenever necessary, of steering committees gathering the partners contributing financially to the activities. Activities carried out specifically on behalf of the Water Agencies cannot be modified without the consent of their representatives in the corresponding steering committees. The modification of the programs carried out with funding from an international organization cannot be decided without the consent of its representative in the corresponding steering committees. IOWater activities are subject, as the case may be, to the advices of, firstly, the Scientific and Technical Board and, secondly, of the INTERNATIONAL ORIENTATION BOARD. The members of the Scientific and Technical Board are appointed by the Management Board on the proposal of the Higher Education Institutions, Universities and Research Centers that are members of the Association. The European and international scientific and technical organizations, with which IOWater is carrying out joint cooperation activities, as well as the European Environment Agency, propose nominations to the Scientific and Technical Board, as far as they are concerned. The Scientific and Technical Board is consulted on the methodologies used and the educational and scientific programs of the Office, as well as on its documentary organization. It organizes IOWater's activities carried out jointly with educational and research institutions, members of the association. It receives all the studies and publications of the Office. scientific, technical and academic organizations with which the Office is pursuing joint cooperation activities. The International Orientation Board is consulted on all IOWater’s activities carried out abroad or under an international cooperation program. It organizes the Office's activities carried out jointly with bilateral and multilateral cooperation organizations, members of the association. They receive all the international studies and publications of the Office. The Presidents of the Scientific and Technical Board and International Orientation Board of the Association are elected by the Management Board of the Association on proposal of their respective members. Either Board may decide to establish, as appropriate, specialized technical sections or regional sections. Either Board may designate a permanent bureau if relevant. The Director-General, assisted by the competent director (s), shall provide the secretariat for the meetings. the portion of the surplus resources that is not required for the operation of the Association for the following fiscal year. All the movable capital, including that of the endowment, shall be invested in registered securities, in securities for which is established the list of nominative references provided for in Article 55 of Act No. 87-416 of 17 June 1987 on Savings, or in securities admitted by the Bank of France for advance payments. the income from remuneration received for service rendered. Accounts will be kept, which shall show annually a profit and loss statement, a balance sheet and an appendix. Each branch of the Association shall keep separate accounts which form a special chapter of the overall accounts. The use of funds from all the subsidies awarded during the past fiscal year is justified every year to the Prefect of Paris, the Minister of the Interior and the Minister for the Environment. The statutes may be amended by the General Assembly on proposal of the Management Board or on the proposal of the tenth of the members of which the General Assembly is composed. In either case, proposals for amendments shall be placed on the agenda of the next General Assembly and shall be sent to all members of the Assembly at least 15 days in advance. The Assembly must consist of at least one quarter of the members in office. If this proportion is not reached, the Assembly shall be reconvened, but at least fifteen days apart, and this time it may validly deliberate, whatever the number of members present or represented. In all cases, the statutes may be amended only by a two-thirds majority of the members present or represented. The General Assembly, called upon to decide on the dissolution of the Association and specially convened for this purpose, under the conditions laid down in the preceding article, shall comprise at least half plus one of the members in office. If this proportion is not reached, the Assembly shall be reconvened, but at least 15 days apart, and this time it may validly deliberate, whatever the number of members present or represented. In any case, dissolution may only be carried out by a two-thirds majority of the members present or represented. In case of dissolution, the General Assembly appoints one or more commissioners, in charge of the liquidation of the property of the Association. It allocates the net assets to one or more similar institutions, either public or recognized of public utility or to institutions referred to in article 6 of the law of 1 July 1901. The deliberations of the General Assembly provided for in articles 16, 17 and 18 shall be addressed without delay to the Minister of the Interior and the Minister for the Environment. They shall be valid only after approval by the French Government. The President shall inform the Prefecture of the Department in which the Association has its registered office of any change in the administration or management of the Association within 3 months. The annual report and the accounts, including those of the local institutions, are sent each year to the Prefect of the Department, the Minister of the Interior and the Minister for the Environment. The Minister of the Interior and the Minister for the Environment shall have the right to have their delegates visit the institutions founded by the Association and have a report on their functioning. The rules prepared by the Management Board and adopted by the General Assembly are sent to the Prefecture of the Department. They can only enter into force after approval by the Minister of the Interior.